Fiberglass Replacement Windows are an excellent choice for replacement windows mainly because of their strength and maintenance free attributes. The windows are made from thin strands of strong glass cable, saturated with compounded resins to create a durable material. This resists the ravages of heat, cold, time and pressure to provide the most worry-free windows and doors available today. Lower Energy Costs – Fiberglass windows help to keep the heat inside during cooler weather and block the sun’s rays during warmer weather with double-pane windows with Low E coating. You’ll be using less heating and air conditioning thereby lowering your energy bills. Maintenance – Fiberglass windows are low maintenance. They are virtually scratch free and won’t get dinged or marred as easily as vinyl. You never have to paint them but if you want to you can. and can be easily cleaned with soap and water. They don’t age as fast as other windows because they resist the ravages of heat, cold, time and pressure to provide the most worry-free windows and doors available today. 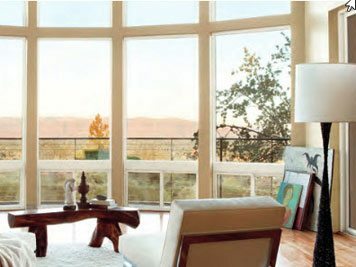 Priced Right – Fiberglass windows are priced in the mid to high range but the investment is well worth it. While the same as or a bit more expensive than vinyl the durability and strength characteristics are well worth the investment. Superior Construction – Fiberglass window frames are made using thin strands of strong glass cable, saturated with compounded resins to create a durable material which is virtually indestructible. This design resists distortion from extreme heat and will not streak or crack in fluctuating temperatures. 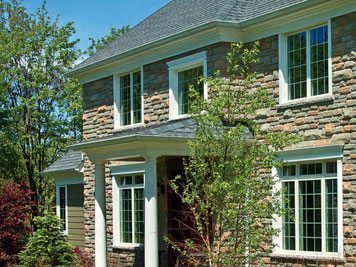 Variety – Fiberglass replacement windows are available in many different sizes, colors and styles. You can choose from double-hung, single-hung, sliding, fixed and bay windows.